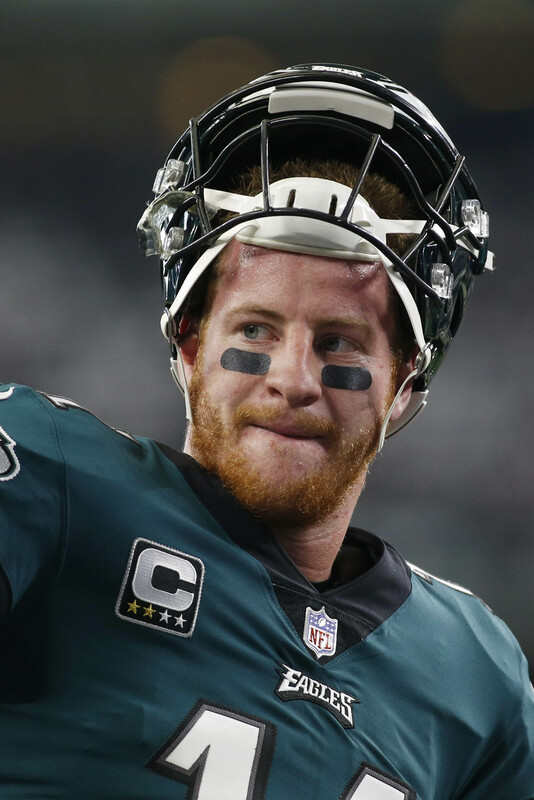 The Eagles will be without Carson Wentz on Sunday and probably won’t have him back at all this season. The team has not formally decided on whether to place him on injured reserve, but it’s likely that we won’t see the quarterback again until 2019, Ian Rapoport of NFL.com tweets. As it turns out, Wentz’s back injury is more serious than it initially appeared. After a battery of tests, the team learned that Wentz has a fracture in his back. Now, the Eagles are doing more tests to determine whether playing would put him at further risk (Twitter link). On the plus side, Wentz will not require surgery either way. With that, the Eagles will head into a crucial Week 15 matchup against the Rams without Wentz. A win keeps them very much alive in the Wild Card chase, but a loss would require two more wins and a whole lot of luck to get them into the playoffs. On the plus side, the Eagles may have the league’s best contingency plan in quarterback Nick Foles. On Sunday, he’ll make his first start since the Eagles’ Week 2 loss to the Bucs. This medical staff is taking a lot of heat this year. Boy, the Eagles sure snookered the Browns when they drafted their always injured franchisee QB. Where is the guy who thinks every time a QB gets hurt Kaepernick is entitled to the job? Shouldn’t you be burning a cross somewhere? The Eagles already have a playoff calibre second quarterback Nick Foles. You may have heard of him. He won a Super Bowl last year. Otherwise, yes, Colin Kaepernick should have a job in either Baltimore or Washington right now among other cities if it wasn’t for righteous redneck fans putting the heat on the NFL to sweep BLM under the carpet. Actually kaepernick should have a job with the ravens if his GF knew how to keep her mouth shut. Did you forget about that? Or how about the numerous times he has turned down workouts with teams where he would be a backup? Oh, one of Kaep’s true believers will be posting about him soon. Until Kaep stops doing his idiotic protests, no team his going to hire him, especially teams with a good locker room. They do not need a bad influence to disrupt their locker rooms. There’s nothing “idiotic” about Kaepernick’s protests. American cops need to stop shooting unarmed black men in the back now. Kap’s protests created a wave of awareness which will eventually result in less of these shootings. But I understand, good old boys just want to sit back with their beer in one hand and the TV remove in the other and zone out while they watch the game over their round belly. Kap actually plays the game, led a team to a Super Bowl and is a hero to millions, guys. He’s changed social awareness on one of the largest issues of our times and he’s got a $20 million endorsement deal from Nike. The same Nike that was scrutinized for using child labor? Equality. Colinn Kapernick is a huge success, economically, culturally and as a sportsman. You on the other hand are hoping to run some ironman race and are seeking sponsors to cover your entry fee. Perceive the difference? Kid needs to learn to throw the ball away. Carson is very good but is quickly getting labeled as injury prone. Wentz has to spend a summer at the Russell Wilson’s Quarterback School for Mobile Quarterbacks. Do whatever you have to do to avoid the hit. Wilson still gets about 80% of the available scramble yards even while studiously avoiding contact. Alex Smith (another mobile quarterback who started for more than a decade) showed similar technique before his horrific leg injury. 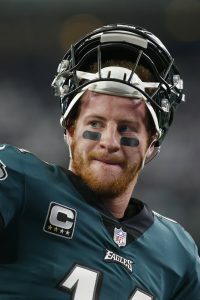 I can’t EVEN imagine a scenario where playing Wentz would provide much benefit to anybody, being as how the Eagles have so little chance of making the postseason. Backs are pretty fragile to begin with. Having a fracture in your back can’t make it a whole lot better. No reason to play Wentz any more this season. Let him rest and prepare for next year. He hasn’t really looked like himself anyway. Understandable considering the knee, and, now, back injuries. But anyone suggesting that Wentz is not the Birds best option for the future is clearly insane. I am thankful for the attention that Kap had brought to an issue that should never be. We live in a free society were we should all be treated as equals. But I disagree that Kap should be a starting QB. He hasn’t thrown a pass in forever. To much rust.